I decided that I wanted to try making bendy dolls for a swap group that I’m in. It was a bit more involved than I thought it was going to be, but I have managed, with a little guidance from some other crafters. I started by searching for pictures of Snowdrop flowers to get a better idea of how they should look and see better detail. We won’t have snowdrops here for some time yet. They are so delicate, it is a wonder that they are able to survive in the cold. I bought some bendy doll bases from an online seller and patiently, okay, impatiently waited for them to arrive. I couldn’t start making dress patterns or really anything until they got here. Made of wool felt, linen thread, cotton embroidery floss, a seed pearl, and a cotton pipe cleaner, cotton cording, and of course the wooden bases which were wrapped in wool and needle felted to add some softness to the hard body. A little bit of tacky glue holds on her hat. A few years ago, on Ravelry, I found a pattern for crocheted Yin and Yang mittens. I made a set of mittens for Bennett out of some lovely Malibrigo yarn, and Etienne has now outgrown them, so it was time for some new pairs. 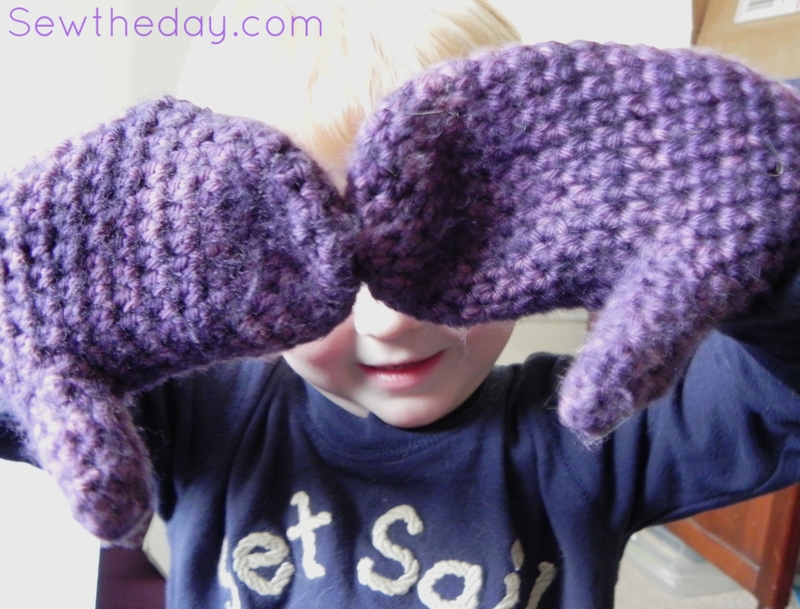 Etienne’s favorite colors are purple and red and he went with purple when asked what color mittens he’d like. So I went on a yarn hunt. I found Cloverhill Yarn Shop fairly easily and I kick myself for not venturing out sooner. The ladies there were very helpful and the yarns were amazing. I did make some slight changes to the pattern this time around. I made the finger section one round longer, the thumb one stitch wider, and the cuts longer for sleeve/coat overlap. 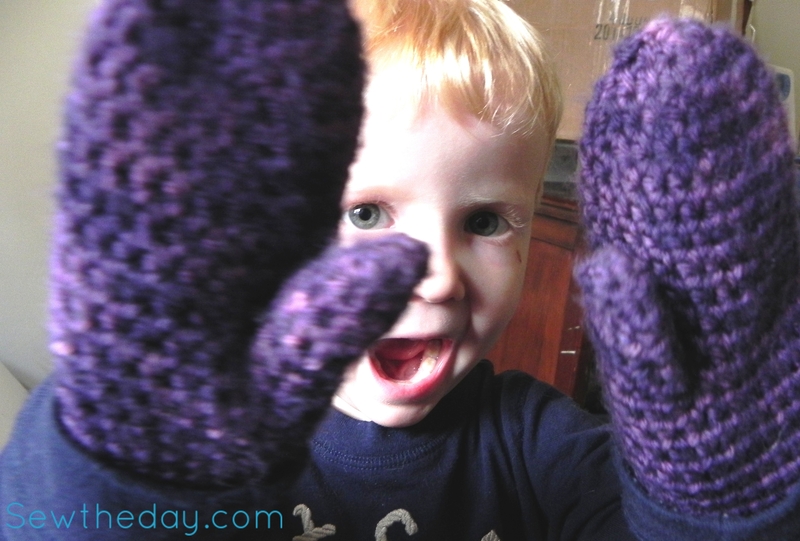 He was very happy with his new purple mittens! I feel like I made the join on the inside of the thumb and at the cuffs much better this time, and the second mitten was better than the first. They’ve already seen a trip outside to play. 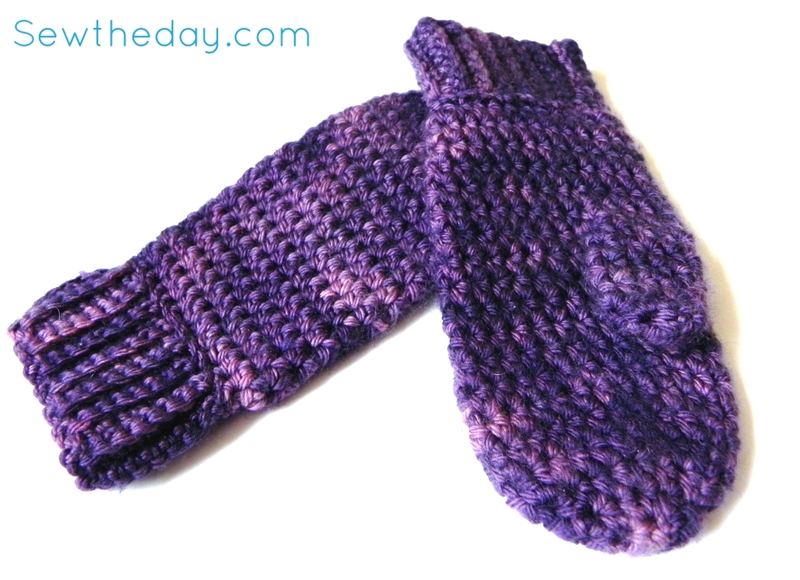 The next pair is for Bennett, now 6, so the size needs to be bumped up a couple of stitches. They’ll be pink. On Wednesday I received my first delivery from Hometown Harvest, a CSA type of delivery service for local or regional fruits, vegetables, and other goods. I was quite pleased with what I received, which included ten pounds of seconds apples from Hollabaugh Bros. in Pennsylvania. Today was the first “normal” day we’ve had, with all the snow this week, so once Bennett was off to school and we were home again, I started on the apple sauce. For seconds, I was impressed with the quality. I only had a tiny bit that needed to be cut away! I’ve had more loss from grocery stores apples. After cooking and processing the apples through my Kitchen Aid, running the pulp through a second time, I ended up with 3 pint-and-a-half jars, 2 quarts, and another half a quart which was put in the fridge for immediate consumption. 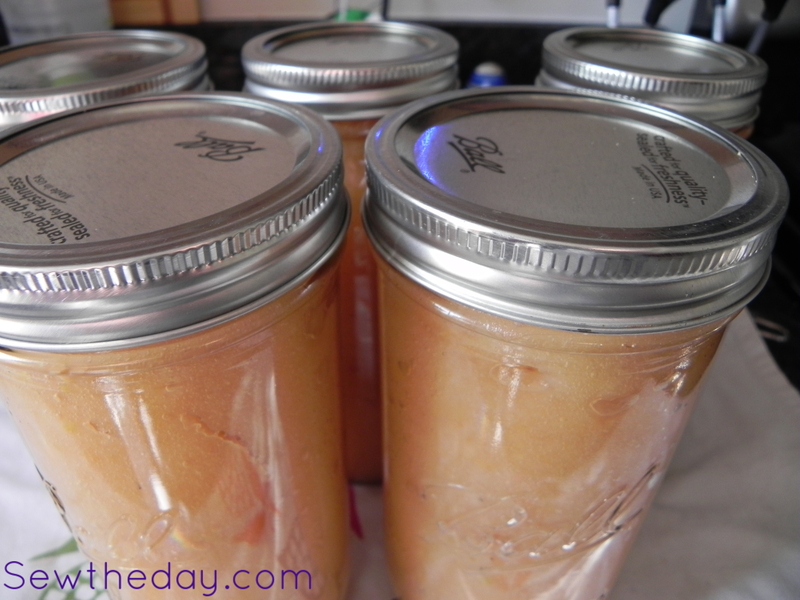 The applesauce was fairly thick, and while I left enough head space, I had 2 jars siphon. they still sealed, but with lots of bubbles. While I was filling jars, the sun came out and cast rainbows all over my kitchen from the prisms hanging in the window. My other kitchen window was looking so bare, especially with the bright white snow outside. I pulled out the kite paper I’d bought before the holidays and made my first window star. I had a couple of hiccups with gluing on the wrong sides of a couple of pieces, but once it dried and I could put it up in the Window, it looked quite nice. It’s been… years. Gracious. So much has happened in the lapsed time since my last post, it would be difficult to cover all the triumphs and heartbreak. I have a bit more time on my hands since graduating college and my kiddos are getting bigger, which also affords me more creating time. 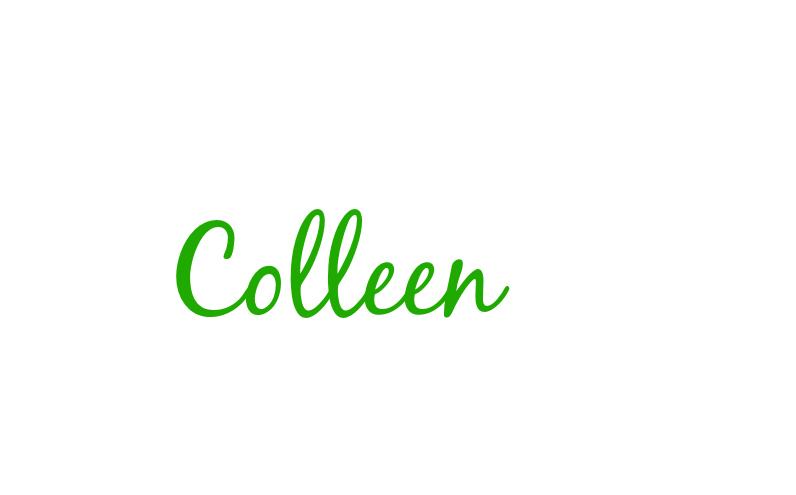 I’m hoping to be able to revive this blog as a way to share my current projects and happenings. 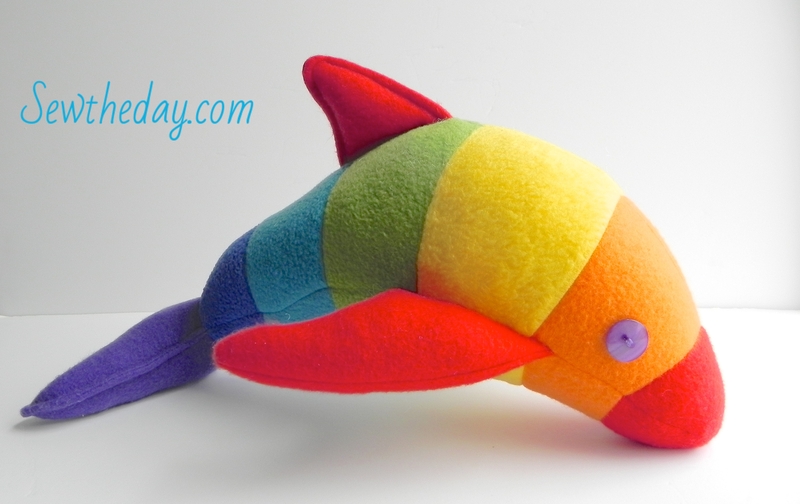 About a month ago, someone asked if anyone would be able to make a rainbow dolphin for her daughter. It was the only thing she’d asked for for Christmas. 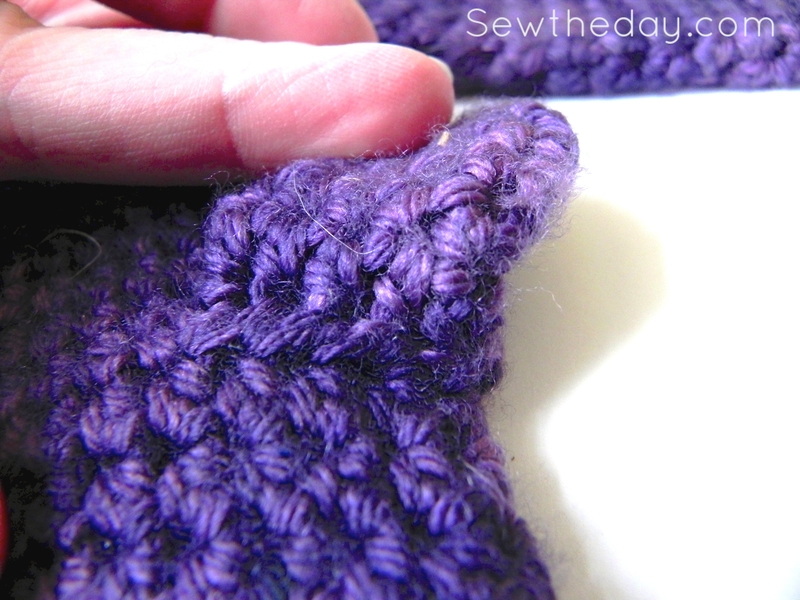 I’d offered to make it for her and the journey into piecing the fleece began. The pattern base was from Funky Friends Factory, Dizzy Dolphin. I’d made several of these before, so I wasn’t new to the pattern. I was, however, new to changing the pattern to be more of a paper pieced type, so I could piece together a rainbow that lined up all 3 body pieces. That was quite a challenge and I went through a couple of line alterations to make the body work with the tail and nose pieces. 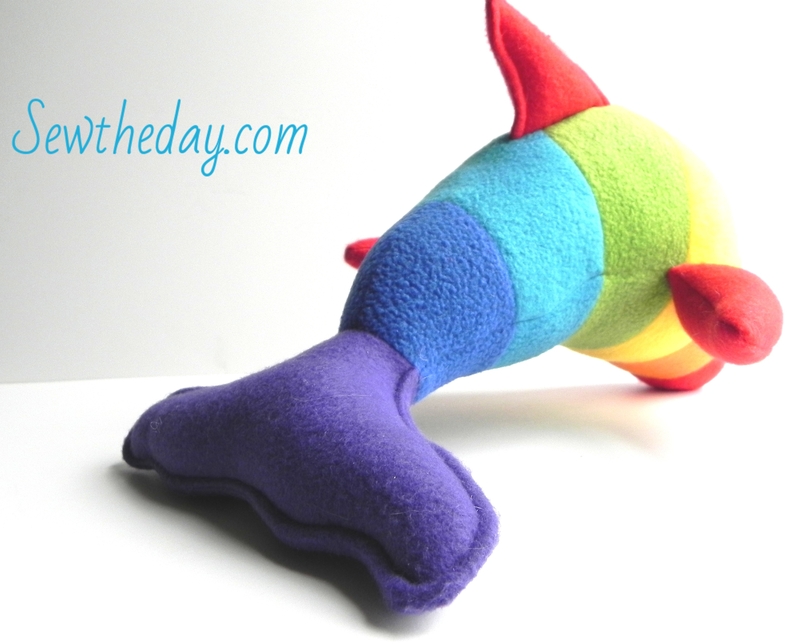 Here is the resulting Rainbow Dolphin for little Phoenix. It was a challenge, but I am very happy with the results! I hope Phoenix has a wonderful, magical Christmas. It’s a new year, in case you missed it. Life has been super crazy over the last 8 months. Between school, deployments, being a geographical single parent, travel, illness, and a death in the family, I’ve really let my blog fall by the way side…Eek! I’m resolved to do better this year. With a lighter course load and my husband returning from overseas soon, I should be able to scrounge up some sewing and blogging time. 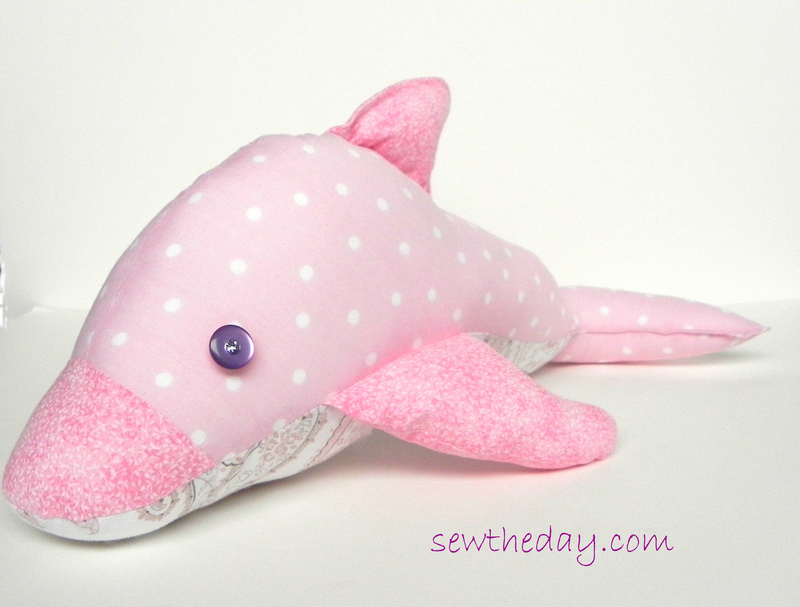 This week I did manage to make a sweet little dolphin for a dear friend’s little girl. She turned 5 yesterday and we had a wonderful time with them yesterday afternoon at the new Children’s Museum of Tacoma. Here is the dolphin I made for my friend’s daughter. After some serious thought, she named her Jane. I have another one all cut out and ready to be sewn. It will be in my shop next week some time. While Ginger Boy was enjoying his first day of Pre-K, Ginger Baby and myself went blackberry picking. With the help of my friend, we picked 8 pounds in about an hour. After running all the berries through my Kitchen Aid to remove the seeds, I had 10 cups of juice and pulp. I found a recipe on AllRecipe.com. Mix the pectin with 1/2 cup sugar in a bowl. Stir the blackberry juice, pectin mixture, and minced green jalapeño together in a saucepan; bring the mixture to a boil for 1 full minute. Add the 3 1/2 cups sugar and return to a rolling boil until the sugar has fully dissolved, about 1 minute. 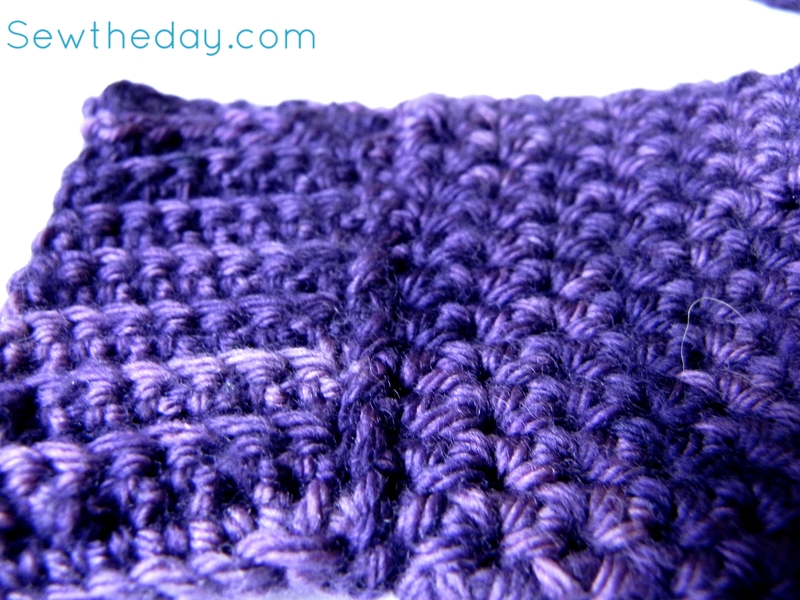 Remove from heat; stir while off heat to remove bubbles and foam for about 5 minutes. Ladle into sterile jars leaving 1/4 inch headspace. Seal jars in a hot water bath. Refrigerate jelly after seal is broken. I ended up with 7 half pints. 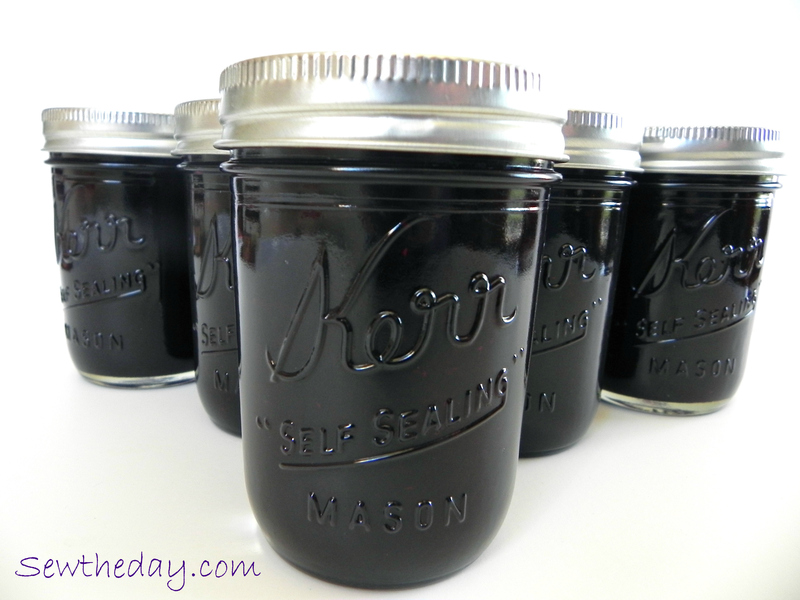 I really loved the Blackberry Lime that I made last year, so I had to make more! 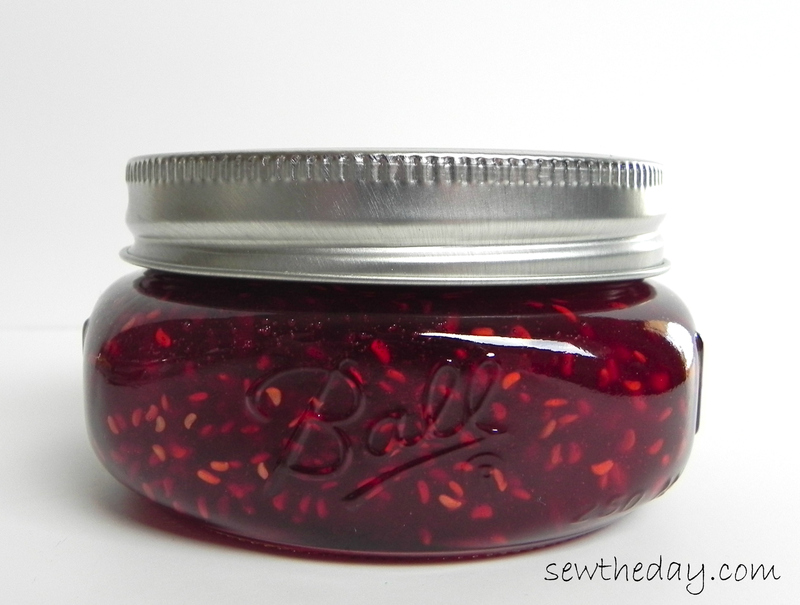 I just used the Blackberry Jalapeño jam recipe and swapped out the pepper for the lime juice. 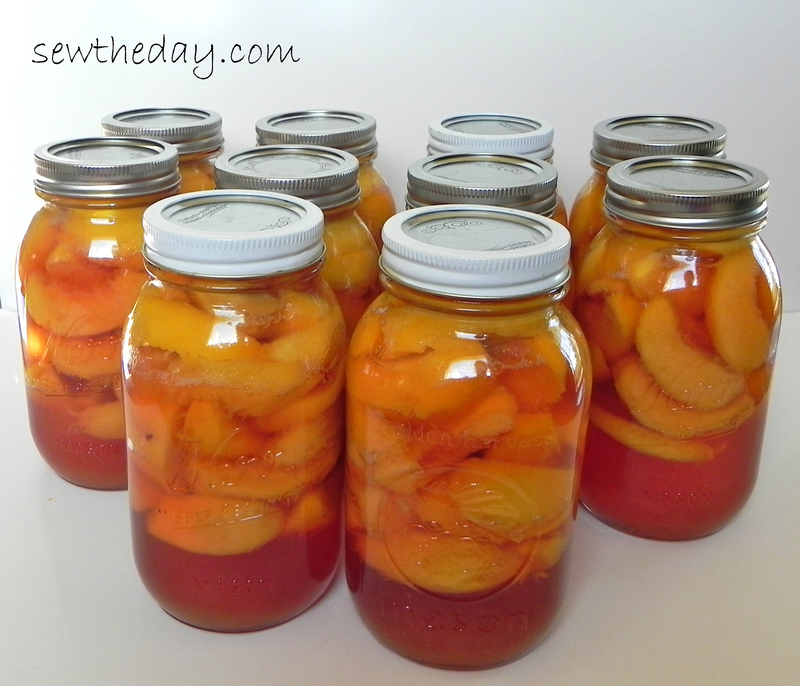 Mix the pectin with 1/2 cup sugar in a bowl. 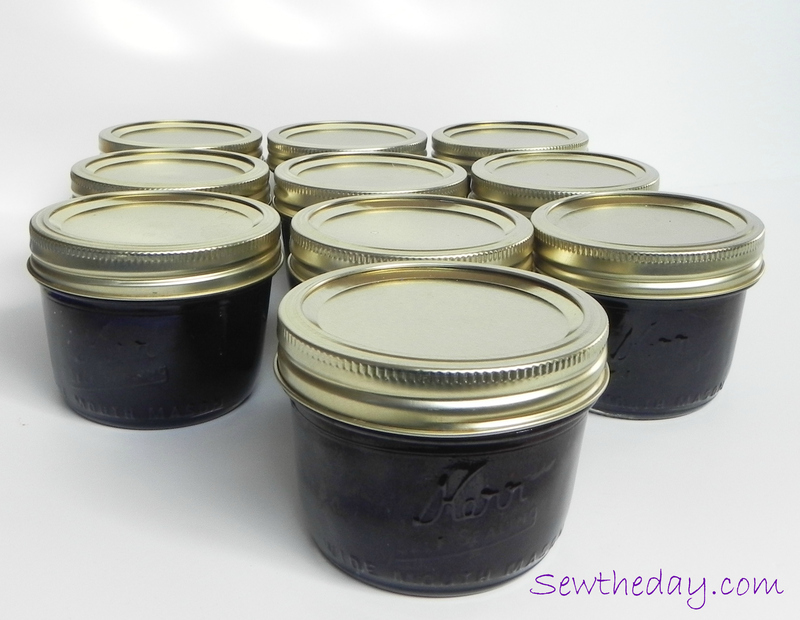 Stir the blackberry juice, pectin mixture, and lime juice together in a saucepan; bring the mixture to a boil for 1 full minute. Add the 3 1/2 cups sugar and return to a rolling boil until the sugar has fully dissolved, about 1 minute. Remove from heat; stir while off heat to remove bubbles and foam for about 5 minutes. 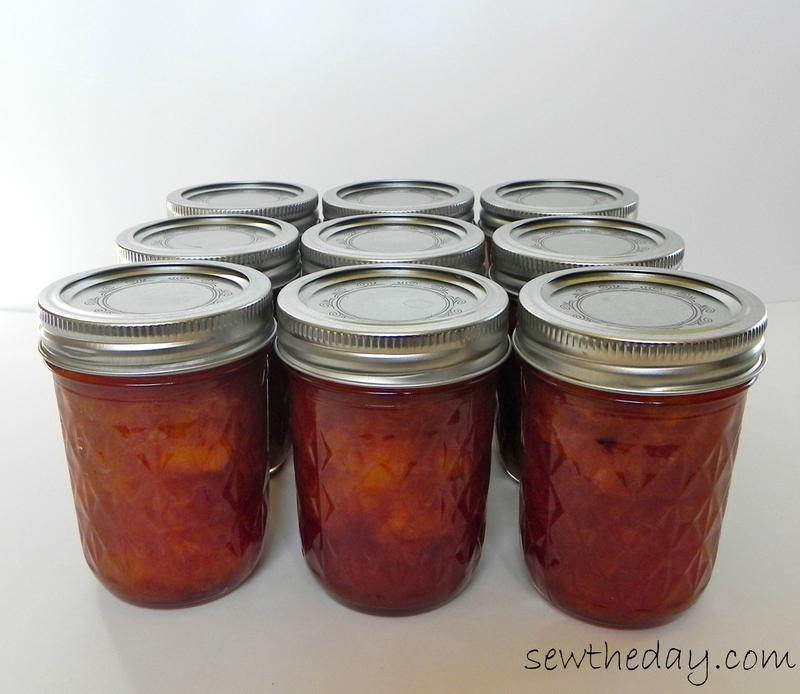 I ended up with 8 half pints from a full batch and 7 4oz jars from a half batch. 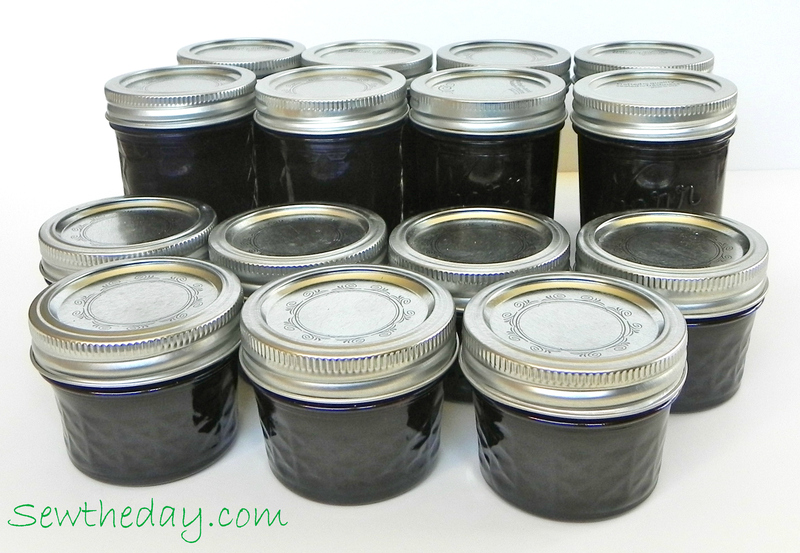 I did have 2 more ounces which I put into another 4oz jar and put in the fridge for immediate use.